Great saint Abu-l-Hassan ash-Shadhili (b. 1196/1197 - d. 1258), may God sanctify his station was the Qutb of his time and the founder shaykh of the Tariqa ash Shadhiliya. 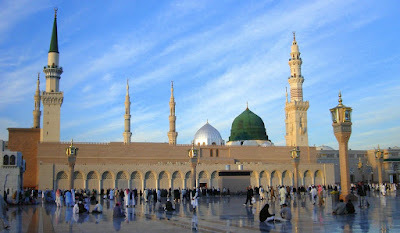 When al-Shadhili, approached Medina, may God ennoble and exalt it increasingly, he stood before the door of the sacred precinct (the tomb of the Prophet) from early morning until noon, bareheaded, and barefooted requesting permission of the Apostle of God to enter. Asked why he did so, he replied, "That he might give me permission, for God says, 'O you who believe, enter not the Prophet's houses until permission be grated to you.' (Q 33.53). Then, he heard the voice of one calling from within the Noble Garden, like that of the one dwelling there, saying, "Blessings and peace in abundance, O 'Ali! Enter!" So he stood before the Noble Garden and said, "Peace be upon thee, O Prophet, with the mercy and benediction of God! The blessing of God be upon thee, O Apostle of God!" I testify that Muhammad is His servant and Apostle, the seal of the prophets, and the leader (imam) of the apostles. I testify that every command, prohibition and information regarding the past and future that he brought is true, containing no uncertainty or doubt. I acknowledge to Thee my crime and and disobedience in thought, reflection, will and negligence. Whatever Thou hast preferred for me, whether something for which Thou dost punish, if Thou wilt, or something for which Thou dost pardon, if Thou wilt, or anything that is comprised in unbelief, hypocrisy, heresy and error, or transgression or misconduct toward Thee, Thine Apostle, Thy prophets, or the angels, men and jinn who are near Thee, or whatever things of Thy dominion that Thou hast especially allotted, in all of which I have wronged myself, bestow upon me what Thou didst bestow upon those near to Thee, for Thou art God, the King, the Generous Bestower, the Compassionate Forgiver." remembering beloved Prophet Muhammad, on his blessed birthday, 12th Rabiul Awwal of Hijri calendar / 19th or 20th March (depending on location and moon) this year. May profound Divine peace and blessings be upon the Prophet of Light, and may through his love - the light of our heart and soul be unveiled. Qutb or Qutub ("axis, pole," or ghauth, "help.") is the highest inner spiritual authority of the age.